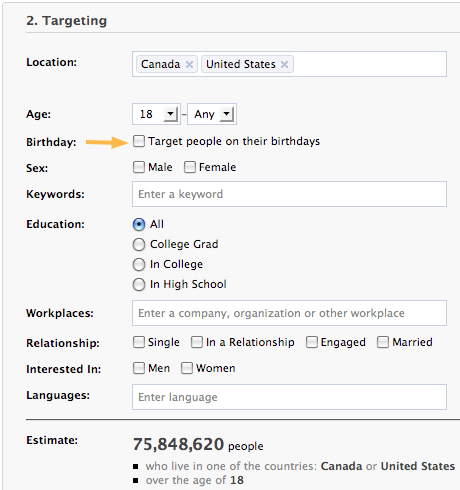 Facebook recently added an additional option to their advertising interface that allows you to target only people who are having a birthday on a certain day. This is gold right here and easy money in the bank. Here’s why — I recently experimented with a few ads and tried different copy out that targeted only users who were celebrating a birthday. What I discovered is that depending on the niche, you can guilt the user into clicking your ad and possibility buying whatever it is you’re selling. Seem a bit harsh? Perhaps, but it worked. I spent $15 on clicks and had already made two conversions within the first hour the ad was running. One thing I should note is that the audience you target that are celebrating birthdays will not be that large, and therefore you may need to bid higher than you normally would to get traffic. But the traffic you will get is — for the most part — very easy to convert.